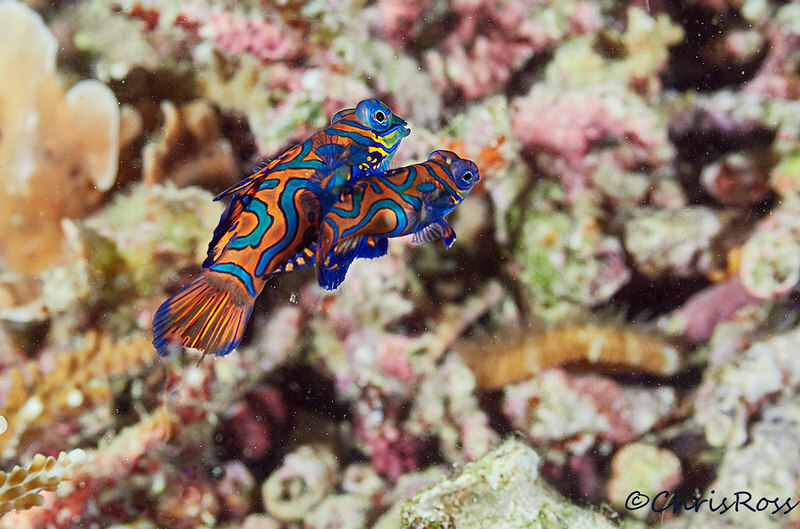 The mandarin fish is quite small at 60mm long and during he day hides in coral rubble, emerging at dusk to rush about 300mm above the coral to mate and disperse their eggs. They start to mate as it is just getting completely dark. So catching them requires good timing and the camera needs to AF relatively quickly. I picked the 12-40 as I knew it would AF faster even though I'd need to crop the image a little. Olympus OM-D EM-1 MkII + 12-40mm f2.8 @ 40mm. INON strobes, Nauticam housing. Chris, this is a wonderful shot. As a semi retired u/w photographer who has photographed this species I can attest how difficult it is to get this shot. Absolutely one of the coolest looking fish. Great shot to capture the mating fish. I have spent many nights playing with theses guys. They are poisonous and apparently have a terrible "odor" to other fish. What is amazing is how different the psychedelic colors are on these fish, region to region. Great patience to get this image. The coral reefs are such a cool ecosystem! Thanks Stan and Mark, funnily enough I didn't feel too stressed getting this, I was using a focus light with red filter which they didn't like so I turned it off and found the EM-1 MkII would easily focus on them in the very dim light at dusk when they emerge for their quick dash to mate. Excellent image of the beautiful fish, congrats on the capture. Another exquisite image! great colors as usual. what is most precious is the moment!